Vladimir Putin believes the ENTRY of India and Pakistan into the Shanghai Cooperation Organization will expand the grouping’s ability to counter contemporary challenges and threats. The expansion of the SCO will also significantly increase its political and economic potential. The Shanghai Cooperation Organization (SCO) summit, which took place in Ufa on July 9-10, ended Russia's year of chairmanship of the security grouping. Its results and Moscow’s chairmanship will have a profound influence both on the further development of the SCO and the political and economic situation in Eurasia, the Pacific Rim and the world in general. In a press conference after last week’s summit, Russian President Vladimir Putin was all praise for the meeting. The summit’s success demonstrated that the SCO is an influential member of the contemporary system of international relations. It also proved that the grouping would play an important role in guaranteeing security and stability in the region and be a vital platform for linking various interests and promoting Eurasian cooperation. 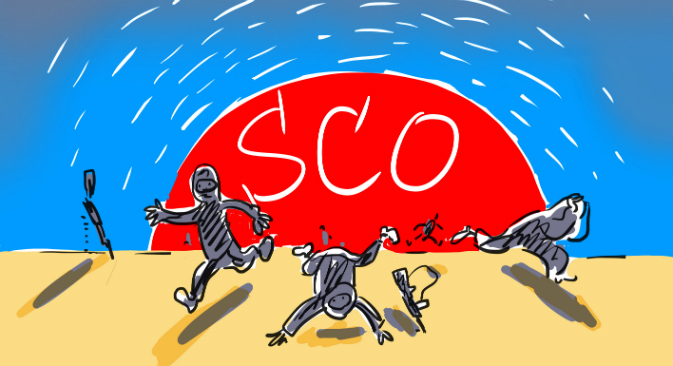 The founding members decided to establish the SCO in 2001, when the primary national security threat in many countries was terrorism. The underlying danger of terrorism led to the formation of the association, with the participation of Russia, China and four Central Asian countries. Much has been done in these years, and the objectives that were set in the beginning have mostly been met. But the world is changing with such speed that dozens of other issues are added to the current challenges of jointly countering terrorism and extremism. This made the results of the Ufa summit more significant. The most important takeaway from the summit was the decision to accept new members. For the first time since its creation, the organization decided to increase the number of participants. It launched the procedure of accepting India and Pakistan. According to Putin, the entrance of India and Pakistan will expand the SCO's ability to counter contemporary challenges and threats. The expansion will also significantly increase its political and economic potential. From an organization of six, the SCO is becoming an organization of eight, with key Eurasian countries joining the association. Of course this will take a certain amount of time. The procedure of accepting new members will be carried out in phases. The applicant countries need to accept a whole series of international legal procedures. This is why the SCO will continue working in the same format until the 2016 summit in Tashkent. The SCO member countries are Russia, China, Kazakhstan, Kyrgyzstan, Tajikistan and Uzbekistan. The observer countries are Afghanistan, Iran, India, Mongolia, Pakistan and now Belarus, while dialogue partners are Turkey, Sri Lanka, joined by Azerbaijan, Armenia, Cambodia and Nepal. The countries are united not only by the fact that they are located in Asia or in Eurasia, but also by their like-mindedness. They have independent domestic and foreign policies, adhere in many respects (not necessarily in all!) to common approaches to the main problems in today's world order, as well as to the key global and regional issues. In the Ufa Declaration, the SCO clearly formulated its calls to strengthen the UN's central command and to increase of the UN Security Council's role in maintaining international peace and security, and in bolstering systems to prevent the spread of weapons of mass destruction. The SCO's economic horizons are also expanding. In its previous summits, the organization sought out a niche in economic cooperation that would help strengthen stability within its borders. The creation of the Eurasian Economic Union (EAEU) and Beijing's promotion of the Silk Road Economic Belt concept radically changed the atmosphere of the region, increasing the degree of optimism. Against the background of widespread Russian economic difficulties, this is a very important phenomenon. The recent summit in Ufa is memorable also for the fact that it gathered dozens of heads of state, who did not fail to take advantage of the unique possibility to hold bilateral and multilateral meetings. The Russian President had more than ten such meetings. A very substantial one was the meeting between the BRICS leaders and those of the leaders of the EAEU and SCO. Is this not a new format for discussing pressing global and regional problems? Western comments on the SCO and BRICS Summits contained much malice. People can think what they want about these associations, but it is too late to destroy them. The farther they go, the more they establish the tempo of international development. This is a fact. The author is Russian Ambassador Extraordinary and Plenipotentiary to the Kingdom of Thailand. Between 2011 and 2014 he was the Russian President's special envoy to the SCO.